Host4site Review 2019: Is Host4site a Good Hosting? Host4site is a website hosting company based in Israel. Established in 2007, the company provides shared hosting, dedicated servers, virtual servers, and linux hosting services. Host4site is an Israel-based hosting provider that was started in 2007. The vendor’s servers are housed in modern data centers located in Israel. Its servers operate on 25% green energy and double network. The hosting company targets small and medium-sized enterprises in Israel. 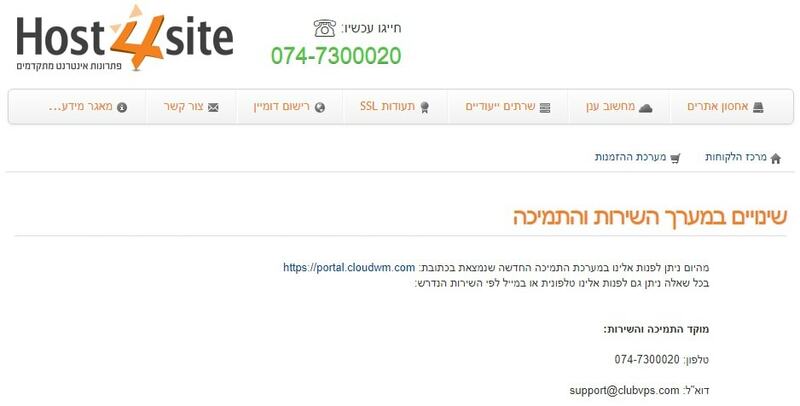 The Host4site website is only available in Hebrew. Host4site servers are housed in modern data centers located in Israel. Its servers run on hardware from leading manufacturers such as HP and IBM. The vendor uses dual network provisioning as well as several server protection systems designed to protect the websites it hosts from potential attacks or failures that would result in downtime. This company has invested in VMware Cloud technology for faster and more robust websites. What’s more, its shared servers run on CloudLinux operating system for maximum load balancing. Host4site uses isolation protocols to ensure that resource hungry websites do not affect other websites hosted on the same server. Host4site virtual servers are connected to high speed network channels with static IP and use both Linux and Windows OS platforms. With these two platforms, users have the options of installing Linux CentOS, redhat, Ubuntu, debian, and Windows Server 2008 and other such supported operating systems. This vendor stores client data in three copies based on its backup solutions that include daily and monthly copies as well as an additional daily backup copy. In addition, the vendor has a Recovery Manager interface, which allows you to recover your lost data anytime from any of the backup copies. Furthermore, the firm offers extended backup of up to 14 days. Host4site offers CMS hosting that includes WordPress, Joomla, and Prestashop hosting packages. While Host4site provides SSL certificates, the feature is not included in any of its hosting plans. Instead, users have to pay for it separately. Available certificates include Wildcard SSL and Standard SSL. While the Host4site’s website looks pretty typical, the design and organization allows users to navigate it with considerable ease. Host4site hosting prices are in line with what other Israeli hosting companies are offering for their services. The hosting provider offers a monthly billing cycle and its prices are available in Israeli New Shekel. The company has no money-back policy. It also has no uptime guarantee. You can reach Host4site via telephone, email, or ticketing system, but he vendor has no live chat. The support team is not available 24/7. It is only available from 8:00 a.m. to 9:00 p.m. IST Sundays to Thursdays and from 8:00 a.m. to 1:00 p.m. IST on Fridays and holidays. My attempts to get in touch with this vendor came to nought. 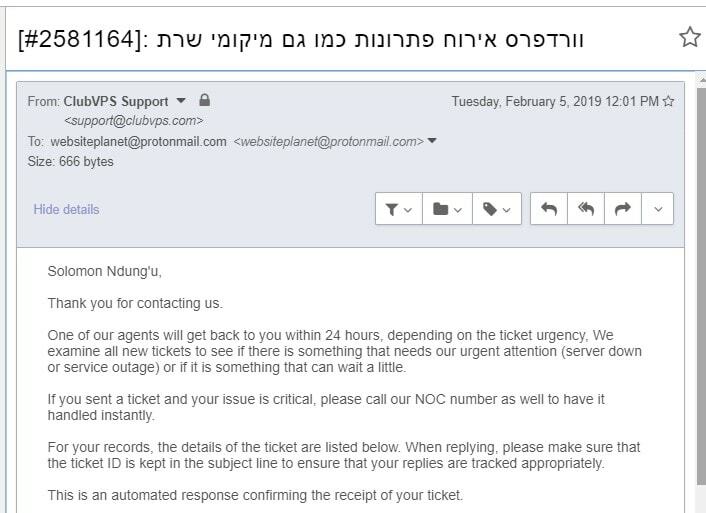 I sent them a support email and got an automated response where the vendor promised to get back to me in 24 hours but never did. While the vendor has put up a knowledge base on its website, it is quite scanty and would prove insufficiently helpful to address hosting issues most webmasters will find themselves facing. Host4site has invested quite heavily in its hosting infrastructure in its attempts to deliver reliable hosting solutions for businesses in Israel. However, its support is a big letdown and a big reason many entrepreneurs might want to consider other vendor’s hosting solutions. Wondering how Host4site stacks up against other Web Hosting companies? Enter any other Web Hosting company and we will give you a side-by-side comparison.